Brown graduate O’Sha Williams may be done of the collegiate competition circuit, but she continues to be recognized with collegiate honors. It was announced today that Williams is one of five Ivy League student-athletes in contention for the NCAA Woman of the Year award. The NCAA Woman of the Year honor is selected based on one’s contributions and personal successes in academics, athletics, service and leadership. The 2016 ballot has 517 nominees that span all three Divisions, the largest pool of athletes in the award’s 26-year history. Williams joins Nina Corcoran (Penn – lacrosse), Jenna Hebert (Penn – rowing), Kathleen Wallace (Harvard – volleyball), and Alexandra Wheatley (Princeton – basketball) as the Ivy representatives on the ballot. Williams’ final collegiate season was indeed memorable. 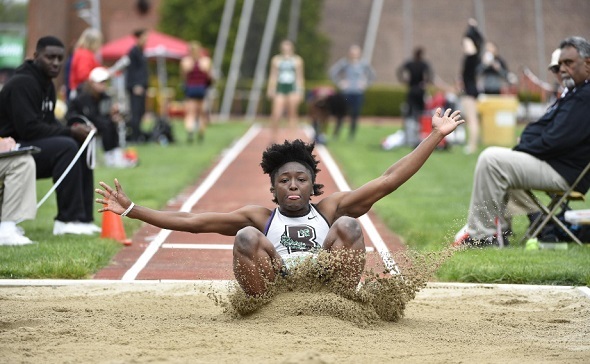 She won two Heps titles this year – the indoor triple jump and outdoor long jump titles – and made it to the NCAA Outdoor Championship finals where she received Honorable Mention honors. Her triple jump distances broke into the all-time Ivy League record books. For her efforts on and off the track, Williams received the Majorie Brown Smith Award, recognizing Brown’s outstanding female varsity athlete of the year. Following a series of conference and division selections, nine overall finalists will be announced in September to ultimately select the 2016 NCAA Woman of the Year on Oct. 16 at the awards ceremony in Indianapolis. Back in 2014, Dartmouth alum Abbey D’Agostino made the top 30 cut for this award by being one of the Division 1 finalists. No Ivy League woman has ever won the award. This entry was posted on Friday, June 24th, 2016 at 6:00 pm. It is filed under Athletes, Awards, Spotlight. You can follow any responses to this entry through the RSS 2.0 feed.